Hi everyone, Julie here, I hope I find you well today? Regency Swirls 3D embossing folder, so a mix of Lisa's June and July classes. I cut a piece of super smooth card to the width of the embossing folder and applied Versamark embossing ink to the embossed side of the folder before putting the sandwich through my die cutting machine. I sprinkled the embossed card with WOW! Clear Gloss embossing powder and heat set. I next applied Spun Sugar Distress Ink with a mini ink applicator, the raised areas with the embossing powder resisted the ink and remained white. I also cut down silver Mirri card and a coordinating piece of blue card - I used the small script stamp from the Polkadoodles Belle Papillon set to randomly stamp in Spun Sugar Distress Ink at the top and bottom edges of the blue piece of card to add a little interest - for my matting layers. 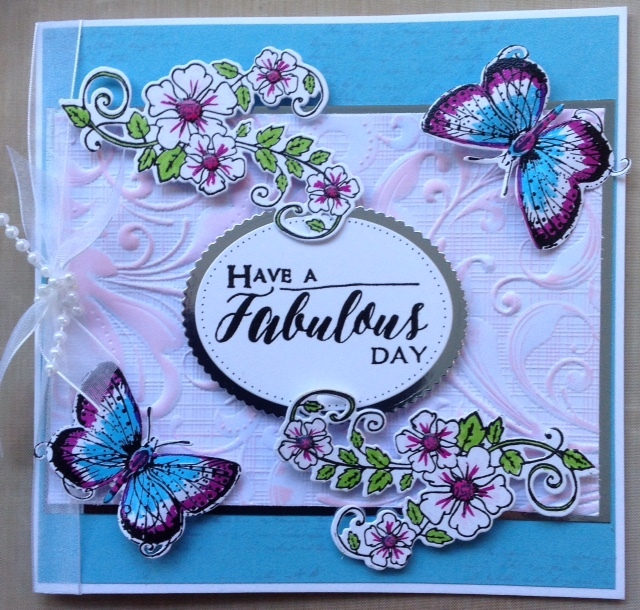 Bella Fleur set twice with Onyx Black Versafine ink, heat setting with clear embossing powder, painting them with watercolours, then die cutting the pieces with the coordinating dies Butterfly 1 and Flower Branch. I chose the sentiment 'Have a fabulous day' from the Belle Papillion set and stamped and heat set this as well, leaving a bit of room around the edges so I could die cut the stamped piece of card an with a oval cutting die. I added some dots around the edge of the sentiment with a black Archival Pen to highlight and die cut a scalloped oval just bigger than my sentiment in the leftover Mirri card to mat and layer this onto. That completes my project, I hope you like it. 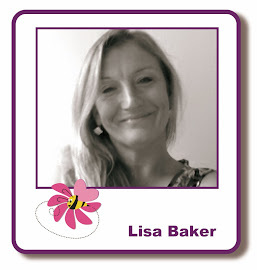 Lisa's next workshop at Grove Green will be on Sunday, August 20. Places are still available and all the information is HERE. Card-io Stamps: Bugs and a Field of Wild Flowers!